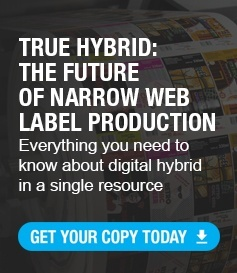 Programming focused on how label converters can adopt affordable digital hybrid technology to stay competitive on the ever-increasing demand for micro to short run work, as well as how commercial printers can better utilize their existing assets with press enhancements that provide high-quality, competitively priced work. Additionally, the event provided an opportunity for commercial printers to grow their business into the label market. For commercial printers there are plenty of opportunities to enter the label market enabling diversification from competition. Attendees at the event watched live demonstrations of Digital One, an entry-level digital label press designed for profitable micro to short run prime labels. The press is made up of 4 color dry toner printing process and a multi-function flexo deck for spot colors, laminates, adhesives or varnishes. Unlike many other small footprint digital devices, Digital One provides inline converting and finishing, delivering ready-to-ship label production. Showing versatility and flexibility, the press printed a variety of label jobs including 6 different variations of beer labels, 3 different variations of wine labels, gin label, and soap labels. In addition, on-site pictures of attendees were printed and converted on-demand, proving ease-of-use and rapid turnaround delivered by the press. The Presstek 34DI 4-color digital offset press was also found printing. The 34DI was equipped with the ECO-UV add-on system which instantly dries sheets allowing an immediate second side print or the capability to move straight to finishing. Eliminating drying time bottlenecks reduce downtime and make runs more efficient. The new in-line curing system is now available as a retrofit to any existing Presstek DI press. Attendees saw a variety of different jobs print which included a bath bomb box, PVC cards,and sheet fed labels. Both technologies showcased how to produce high-quality work, reduce turnaround time, and increase efficiency for their owners. The solutions reinforce Mark Andy’s core belief that it’s not about the technology you produce work on, but the way to be most profitable and meet customer needs. Mark Andy is commitmented to drive pressroom profitability with full life cycle solutions designed around their business needs. It’s not a one size fits all world and Mark Andy is well aware and equipped with solutions to support any market and every job. Label converters and commercial printers witnesses profitable production during the Open House. Joe Ray, Business Development Manager, sharing results Digital One’s install base reports with the entry-level hybrid press. Visitors experience first-hand how to optimize production with a Presstek 34DI offset press. On-demand printing on Mark Andy Digital One. Sheet-fed labels off of the Presstek 34DI digital offset press. Bath bomb packaging printed on Presstek 34DI with ECO-UV.